You are an unpredictable young man, but I’m glad you like the legendary Nerbick. I would have bet against it. Mr. Chops can provide tons more background, but this band really was a hipness litmus test back in the 70s-80s. When people were loving bands like Kansas and Rush, knowing and liking NRBQ (not really pronounced Nerbick) demonstrated you were cool. If you liked Blackflag or Stiff Little Fingers or The Cramps too, it was all over. You won the Hiplympics. J$, I have got to tell you that in my experience NRBQ fandom has been about the farrest thing imagineable from a hipness litmus test -though I think I know how you might see it differently. There may have been a hipster-led pocket of NRBQ fans in Chicago in the early 1980s. In fact, it was on some college station in Chicago that I heard “Ridin’ In My Car” for the first time and caught the bug. It was also the last time that I ever heard the Q on the radio if I was not the DJ playing them. The band members themselves are and were entirely oblivious to image or fashion. Look at them! I think their handlers had to get them to wash their faces for the album photo shoot. NRBQ fans tend to be devoted music nerds. But not hipsters. But this is all beside the point. 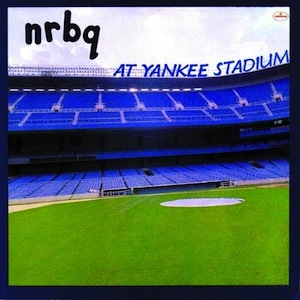 Why do I love NRBQ so much? That is the issue that I would like to address. Because these guys play SO well and never make a show of it. Because they always respected the intelligence of the audience enough to go out every night and play everything a bit different from the day before, fall on their asses a few times but play from the heart. Because Terry Adams tries to channel Thelonius Monk and Sun Ra through a Jerry Lee Lewis filter without pretence or guile. Because Joey Spampinato has written some of the best three minute pop gems that never made it on the radio or MTV . Because their version of Get Rythm rocked so hard that Johnny Cash heard it and immediately started to play it that way. Because Joey Spampinato turned down the bass chair in the Stones when Bill Wyman quit because it would have been work to him. Because they tarred and feathered a cabbage patch doll on the Hill of Three Oaks when they played Carleton Spring Fest in 1986. Because they stuck it out for more than 30 years for the love of the music and the fans and for no money. In about 1996, Big Al Anderson had had enough of the road and the lack of commercial success and decided he could make more money and live better as a songwriting gun for hire in Nashville. He was right, too. Ouch. A body-blow to the band but they soldiered on. Johnny Spampinato was an adequate replacement for Big Al. SE, if you are interested enough, read this http://www.nrbq.com/news.cfm. It depresses me. After all the years, Joey Spampinato decided to play bars on Cape Cod with his brother rather than to continue NRBQ, leaving Terry Adams to somehow soldier on while fighting throat cancer (what do you think are the odds that Terry had health insurance?). You could take the best songs off of the last (current version) NRBQ and add the best ones from the Spampinato Brothers album and Al Anderson’s last solo try and have a pretty great NRBQ album. It is a shame that is not what happened.